The streets of Los Angeles are infamous for the constant hustle and bustle. LA traffic hardly knows a quiet time, with impatient drivers honking the moment a light turns green and others scurrying across an intersection making a left turn even though the light just turned red. Imagine then, the solitude of these very roads, closed to vehicular traffic in the moments before 26,000 people embarked on a 26.2 mile journey from Dodger Stadium heading west to Santa Monica. 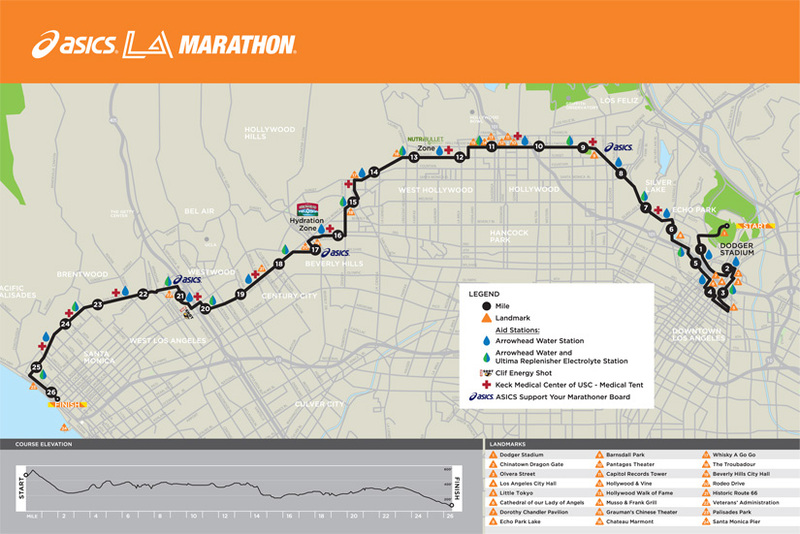 I got to experience an LA unknown and unavailable to most people yesterday during the LA marathon, an empty LA, vacant of cars and people. 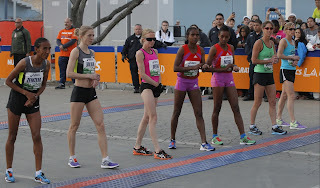 My LA adventure transpired due to the unique format for the professional runners: an Equalizer. With the Equalizer, the women are given a pre-determined head start, hence the empty roads, and the men chase them down with the first across the line declared the winner. I am no stranger to the Equalizer; the Life Time Fitness triathlon in Minneapolis utilized this system to create excitement among the competitors and spectators. It was a marquee event upon which an invite was coveted. 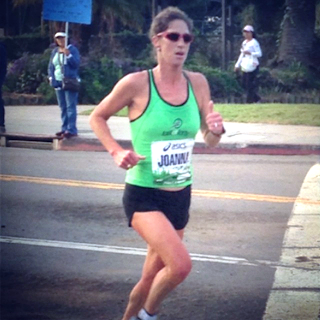 There was bonus money for the top 5 across the line, unlike the LA marathon which has a bonus solely for the winner. With only one person reaping the spoils, the men’s and women’s fields in LA are generally tiny, which is probably how I was able to obtain a start in such an esteemed field. There are many advantages to acquiring a spot in the elite field. 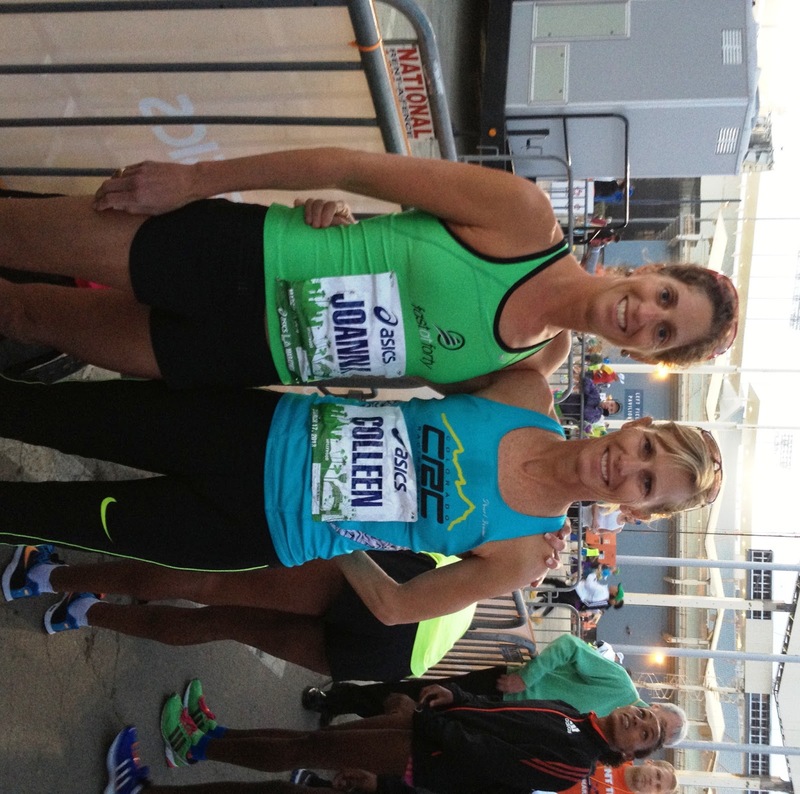 The race organizers take care of the runners, ensuring that they have the best race possible. There is no need to fight the throngs at the expo to pick up race packets. All of that is given to the athletes after a private race meeting. Speaking of the meeting, the quote of the day had to be this: "Whoever finishes first, please look jubilant when you cross the line and whatever you do, DO NOT, hit the stop button on your watch." The hospitality suite is always stocked with food. 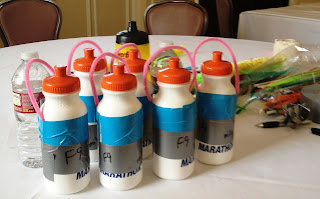 And then, there is my favorite part, the water bottle tables for special needs and the requisite tradition of decorating the bottles. In this particular race, the tables were situated every 4 miles. Yes, that is something to look forward to during a long day. My bottles, adorned for the big day. The women's field ready to go. 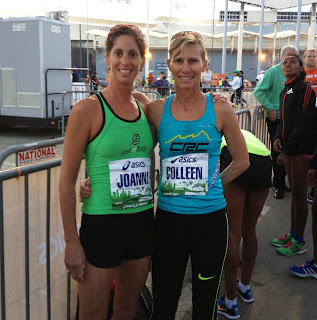 Only seven women toed the line yesterday, one of whom was my training partner, Colleen De Reuck. We planned to run together until such time we couldn’t. Even though she had doubts about her fitness, I knew I would be the one to fold; after all, her years and years of marathon prowess were no match for my relative naiveté. Her company made this cross-town travail much easier, though. The other 5 women pulled away moments after the gun went off, 18:38 before the rest of the LA marathon field. The two of us ran through the lonely streets of downtown LA, with only the occasional spectator imploring us to catch the women in front. Um, if we could catch them we wouldn’t have been dropped in the first place! Once we made our way out of downtown, the streets started to fill with spectators and the occasional proselytizer, making the route seem less forlorn. 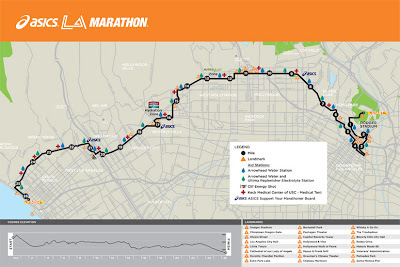 At mile 16, the lead group of men whizzed by at a dizzying speed. Colleen started to pick up the pace, and I knew it was just a little too much. I told her to continue on without me, I did not want to ruin her race. The last 9 miles were a mental battle. With no runners to keep me company, I felt very alone. My legs were starting to tire from the incredibly hilly first 10k (holy crap, whoever designed the new course must never have run a marathon), and I had to constantly fight the voice in my head that kept saying slow down. I made my way through the tail end of the course, shivering from the cold and enduring pain in my feet from the pounding. As I ran down the finish chute, I could see myself on the Jumbotron. I looked horrible, my arms and legs flailing all over the place. My form had deteriorated miles before, so much so that a spectator shouted out for me to lift my knees (which I really don’t do when I am fresh). Even though I slowed noticeably toward the end, I held it together enough to finish only a minute slower than my PR, which was run on a much easier course. I placed 6th overall in a time of 2:44.48. I am not hobbled too badly and hope to recover quickly. The weather is only getting better, and Diesel the Dog will be anxious to get some exercise.